In the last couple of weeks, a lot has been reported about Samsung Galaxy A8s, which will be the South Korean technology giant’s first ever smartphone to come with a cut-out display panel. Another report has just surfaced online which claims that the upcoming smartphone by Samsung will come without a 3.5mm headphone jack. The port left the Apple‘s line-up a long time back, and smartphone makers like HTC and OnePlus followed. A Chinese tipster who uses the pseudonym MMDDJ_ on Twitter has suggested that Samsung Galaxy A8s would not sport a 3.5mm jack. However, this has not yet been confirmed by Samsung. But if the speculation is indeed correct, then Galaxy A8s would be the first ever Samsung smartphone to come without a 3.5mm headphone jack. And we can also expect Samsung Galaxy S10 to follow the footsteps and ditch the headphone jack. What also supports this speculation is the fact that Samsung usually tries new features in its mid-range smartphones and then introduces them in their flagship line-up. So if Samsung is planning to skip the headphone jack in Galaxy S10, it would definitely try it out first in Galaxy A8s smartphone. As we mentioned earlier, HTC and OnePlus also recently ditched the headphone jack and instead opted for a digital-to-analogue converter, which is claimed to enhance the audio performance of the devices. And Apple abandoned the 3.5mm headphone ages ago when it launched the iPhone 7 in 2017. Coming back to Samsung Galaxy A8s mobile, a documentation available on the US FCC website has confirmed that the smartphone will sport a cut-out hole on its display. 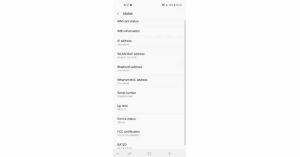 In the documentation, Galaxy A8s has been codenamed as SM-G8870 and it came with a screenshot of the smartphone that has a room for the hole that will house the selfie camera of the handset. It is placed on the top-left corner of the display of the smartphone, as reported by GalaxyClub. The listed screenshot also shows that the display of Samsung Galaxy A8s will come with a 19.5:9 aspect ratio. Some reports say that the upcoming handset may have a notch on the left side of the display, we think it wouldn’t have a notch at all. Previous reports also said that the smartphone will have an Infinity-O display, but as Samsung showed at its developer conference, the cut-out hole in Infinity-O display is present in the centre and not the side. Tipster Even Blass also said that Samsung Galaxy S10 will also sport the cut-out selfie camera. The specifications of Samsung Galaxy A8s include a 6.39-inch full-HD+ display, Qualcomm Snapdragon 710 SoC, 6GB of RAM, 128GB storage and a 3,400mAh battery.